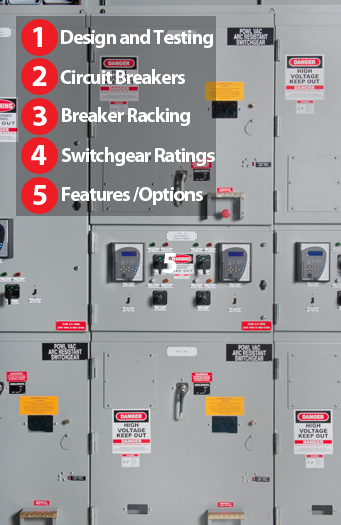 Powell ANSI medium voltage metal-clad switchgear is available with a wider range of ratings and designs than any other North American manufacturer. These choices allow you to select the design that best suits your specific application. PowlVac® switchgear for heavy industrial applications and Power/Vac® switchgear for light industrial and commercial applications are offered as standard construction with the full range of ANSI published ratings. Available in a one-high or two-high design and in standard or arc-resistant construction. PowlVac-AR® arc-resistant switchgear is available for applications from 5kV to 38kV and can be provided as Type 1, Type 2 or Type 2B construction as defined by ANSI standards. The 5kV narrow design PowlVac-NDAR® is also an arc-resistant solution. Certified test reports for all tests are available. Powell switchgear is the most tested in the industry. Powell manufactured circuit breakers for ANSI switchgear are rated as 3-cycle breakers (3 cycles or 50 msec or less from trip initiation until arc extinguish). As an option a 5-cycle rating is available. The control circuit connection is made through a front-connected umbilical which provides several advantages not available with the approach used by competitors. With the front connected umbilical you get assurance of a positive connection of the secondary circuit and you can connect the circuit breaker to the secondary circuit while the breaker is completely withdrawn from the switchgear and test the actual circuitry operation without the need for control extensions or exposure to potentially energized parts. The control umbilical is mechanically interlocked and will discharge the main spring if removed. Removal is not possible if the breaker is in the connected position. All Powell medium voltage circuit breakers have a UL and C-UL Label as a standard. A complete range of Replacement Circuit Breakers is available. These utilize vacuum interrupters and are designed to fit into existing obsolete switchgear from a variety of manufacturers. Three racking options are available. The racking mechanism itself is part of the circuit breaker assembly which allows preventative or regular maintenance to be performed with the circuit breaker de-energized and completely removed rather than work inside the cell assembly in cramped spaces or in PPE clothing. Standard racking is used on standard construction equipment only and utilizes a manual hand crank and is performed with the cubicle door open. Closed-door racking is optionally available which allows for the manual racking of the circuit breaker with the cubicle door closed. OnBoard Racking® is optionally available which allows racking of the circuit breaker through a remote control panel or through other Powell Automation system control screens. Portable remote racking devices are available for all models and constructions. For safety of operators Powell strongly recommends the use of proper PPE whenever working on, in or around metal-clad switchgear. 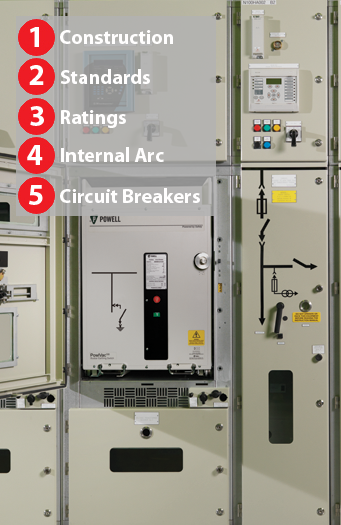 Powell ANSI metal-clad switchgear is available in a full range of ratings. PowlVac-ND® and PowlVac-NDAR® is the 5kV rated 26" wide narrow design solution for those projects where footprint is a critical factor. Available in both a one-high and two-high design and in standard and arc-resistant construction. Circuit breakers are rated for continuous current at 1200A or 2000A with interrupting ratings of 36kA and 50kA. PowlVac® and Power/Vac® metal-clad switchgear is rated for applications from 5kV to 38kV and 5kV to 15kV respectively, and is available in one-high and two-high configurations. Continuous current ratings of 1200A, 2000A and 3000A for all voltage applications are available, additionally a 4000A roll-out design and a 5000A fixed-mounted circuit breaker can be used for higher current applications at 15kV with the PowlVac design. Interrupting ratings include 25kA, 36kA, 50kA and 63kA at 5kV and 15kV, 25kA and 40kA at 27kV and 40kA at 38kV. Power/Vac also offers an OEM program. PowlVac-AR® arc-resistant metal-clad switchgear comes in three configurations as defined by ANSI. Type 1 for front only protection, Type 2 adds rear and side protection and Type 2B adds low voltage instrument compartment protection. Powell circuit breakers utilize a front connected control umbilical which provides greater flexibility and safety in testing circuit breakers while disconnected from the primary but still connected to the control circuitry. Cubicle coding plates allow for any higher-rated circuit breaker to be inserted into any lower-rated cell. This minimizes the need for spare circuit breakers and keeps downtime to a minimum. The closing handle on Powell arc-resistant switchgear doors actuates the arc-resistant feature and prevents operator error from keeping the arc-resistant feature from being correctly engaged. Through the use of BriteSpot® and Sentry®, operators can easily monitor and track the thermal situation in all parts of the switchgear on a continuous basis providing 24/7 information so that preventive rather than reactive maintenance can be applied. Enhanced safety can be achieved because the racking mechanism is an integral part of the Powell breaker. Powell can offer OnBoard Racking® so the user can monitor breaker status; close, open and trip the circuit breaker remotely; and move the breaker between connected, disconnect and test positions. ​PowlVac100TM Type 298 MV controlgear is a modular construction of metal enclosures incorporating various arrangements of incomer, feeder, bus tie and motor starter cubicles. The incomer and bus tie cubicles are fitted with a circuit breaker and the feeder cubicles are fitted with either a circuit breaker or a vacuum contactor. The cubicles that make up the switchboard are connected together via a hard drawn high conductivity copper bus bar system. Copper risers are used to connect the equipment within circuit breaker, vacuum contactor or voltage transformer compartments to the bus bar system. Each vacuum circuit breaker cubicle contains a withdrawable circuit breaker, a low voltage compartment for protection, instrumentation and control circuits, a bus bar chamber that allows bus bars to run into each cubicle via riser bus, a cable chamber for incoming or outgoing connections, and voltage transformer when required. ​PowlVac100TM Type 298 MV controlgear is available in 700mm cubicle widths for 40kA and 50kA interrupting capacity. For higher interrupting ratings a 1000mm cubicle width is available rated at 50kA or 63kA. The main bus rated is rated to 4000A below. All PowlVac100 controlgear is rated for 50/60Hz and voltage ratings of 3.6kV, 7.2kV, 12kV or 13.8kV. In addition to PowlVac100 we can provide ABB vacuum Circuit Breakers with fault rating from 16kA up to 50kA. ​The internal arc classification for PowlVac100TM Type 298 controlgear has been tested in accordance with IEC 62271-200 Annex A (Internal Fault - Method for Testing the Metal-Enclosed Switchgear and Controlgear Under Conditions of Arcing Due to an Internal Fault). The Internal Arc Classification (IAC) makes allowances for internal overpressure acting on covers, doors, inspection windows, ventilation openings and other similar elements. It also takes into consideration the thermal effects of the arc or its roots on the enclosure and of the ejected hot gases and glowing particles, but not damage to internal partition and shutters not being accessible in normal operating conditions. PowlVac100TM vacuum circuit breakers are an automatically operated electrical switch incorporating the use of vacuum interrupters. They are designed to be incorporated into PowlVac100 Type 298 MV Switchgear. These circuit breakers are designed for normal service between -20 °C and +40 °C and at altitudes 1000 meters or less. For applications outside of these ratings de-rating may be required and Powell UK will assist with proper application. Circuit breakers are rated 40kA-1600A. 50kA-2000A, 50kA-3150A and 63kA-4000A. For a 4000A continuous current rating, forced air cooling is required.